You are currently browsing the The Pet Product Guru blog archives for the day Tuesday, August 6th, 2013. Clumping Litter, Could It Be harmful to Your Cat? Many people have said that clumping litter, that has been around for many years can be harmful to your cat. Ed Lowe developed the first clumping litter. 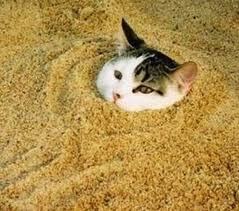 Until then cats either relieved themselves outside or frequented litter boxes filled with ashes and sand. They were not the best materials. Neither absorbed odor well and the ashes or sand was tracked all over the house. In the 1940’s Lowe suggested to a neighbor to try absorbent clay as opposed to ashes and sand. The clay material was made by Lowe’s fathers firm and was used to clean up industrial spills in factories. The absorbent clay proved to be a marked improvement over ashes and sand. Over the years, scoopable clay litter was refined and developed into a product that was super absorbent and would clump when the cat urinated. The litter was further refined and is now super absorbent and masks odors pretty well. The safety of clumping litter has been questioned in the past. When sodium bentonite comes in contact with liquid, it swells to about 15 times it’s original volume. If ingested, the clay material makes contact with the natural digestive liquids and creates a clump inside the cats stomach. If the litter is inhaled, it could mix with mucus in the lungs and cause respiratory distress. The ASPCA, suggests that kittens avoid clumping litter because their digestive systems are more sensitive. It should also be avoided if older cats ingest too much litter. I don’t use it because I just don’t like it. It seems that as the cat urinates, the litter becomes more difficult to remove. If your like a mix of modern rock, dance, pop 60’s 70’s 80’s and 90’s then try Lindbergh Radio. It’s part of the Edgewater Internet Radio Network! We also have five additional stations featuring a wide variety of musical formats. Check us out!